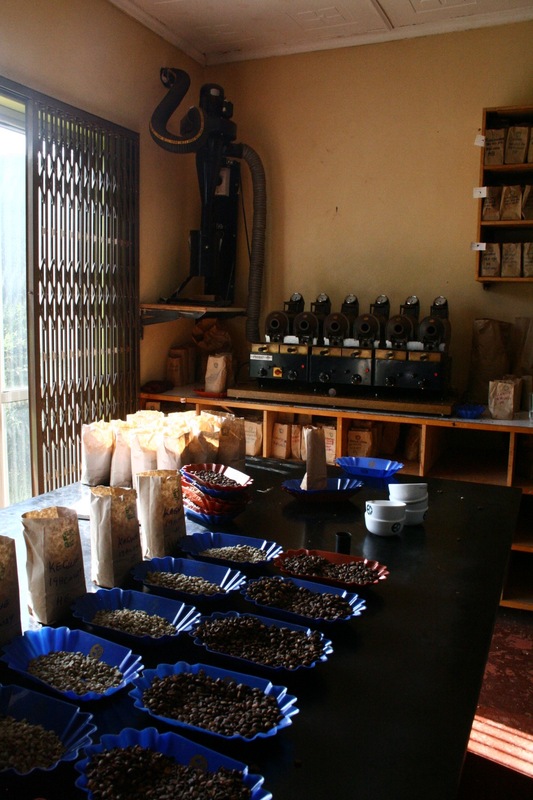 The Kenyan buying season is one of my favourite times of the year, a great reason to visit a country and coffees that I love. The harvest is running a little late this year, so even though I delayed my trip by a couple of weeks I might still have arrived a few weeks before the real big hitters roll in from the mills. Nevertheless, getting early indicators of which factories and lots are going to stand out is a good base for later sample shipments. 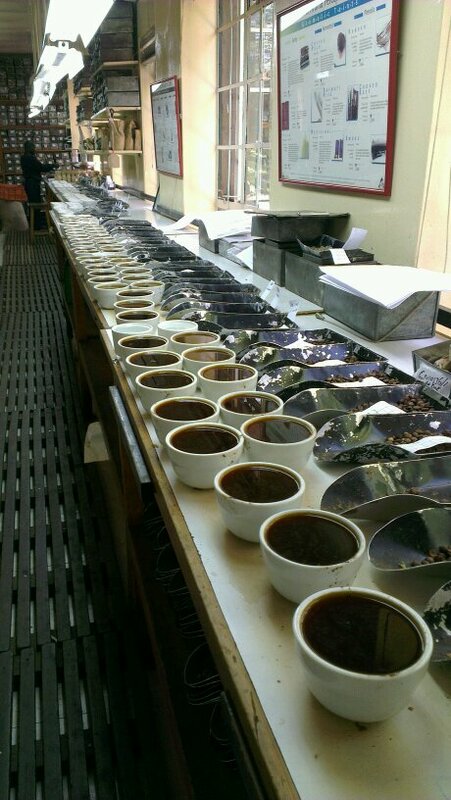 Wednesday was a lovely day of extensive but leisurely cupping at the Dorman offices. With Kennedy and Daniel I got a chance to take part in a cupping of some of Armajaro’s C lots, including some Tanzanian AA’s, AB’s and grinders. 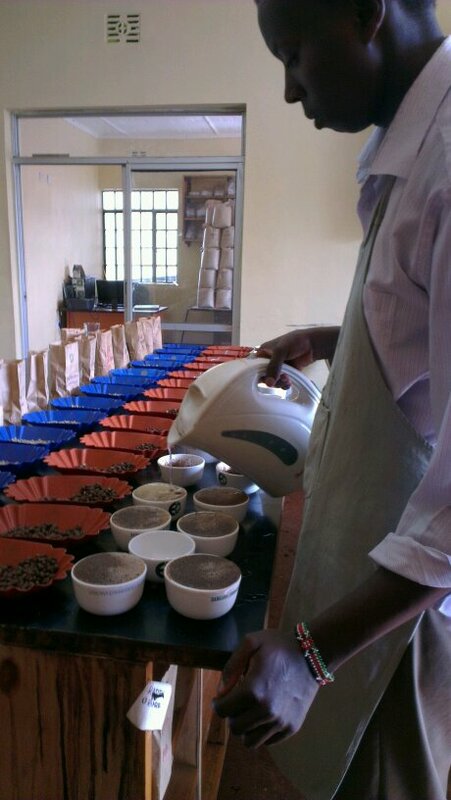 It’s always useful to calibrate yourself on the types of coffee that go into bulk blends, instant and the like, it really makes you appreciate the clean, articulated, complex coffees that we strive to produce in specialty. 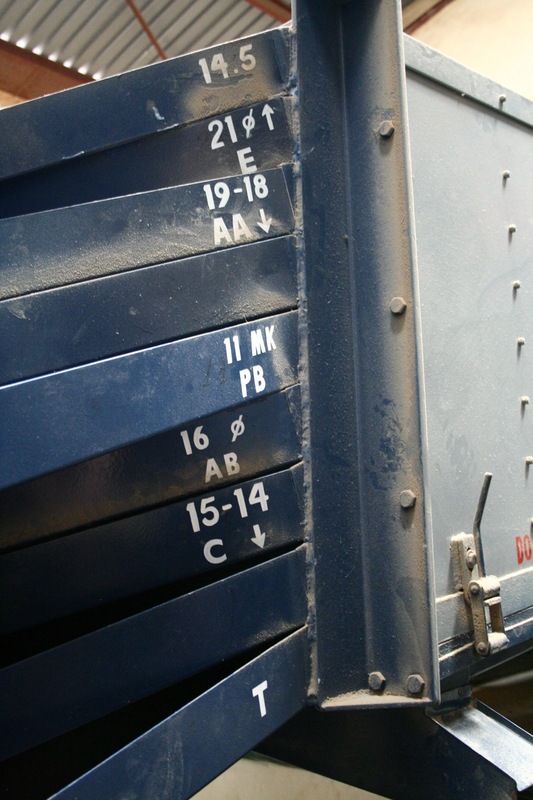 We went through between 100 -120 samples, most of them from week 13’s auction catalogue, and some outturn weeks 17 and 18 samples from the mills. Unlike last year, and more true to ‘tradition’, the AB’s while mostly very good, are not standing out as much as the AA’s, and there are a fair few AA and PB lots that are already showing promise. With John retired, Sam has taken over the sample roaster and has really kept the coffee’s potential showing through well. Even in the cases of bad potential, like the Western Kenya coffee that had potato in one of the cups. A first for me in Kenyans, I was really surprised to see this. 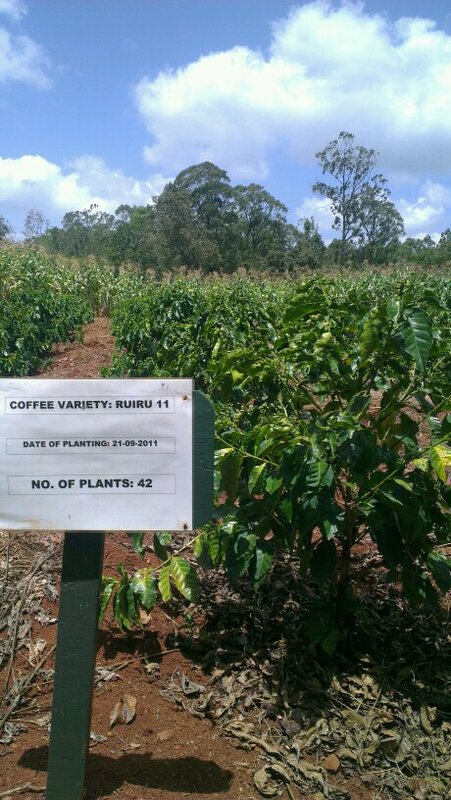 Lydia mentioned that this lot was from a factory close to Lake Victoria and not from the areas around Nyeri where we usually find our coffees. I’m not sure if it has anything to do with what’s in the water, but hopefully it’s not something that is going to keep spreading across the lake from the potato-ridden Rwanda and Burundi. As the cupping progressed I was happy to see some old favourites showing well across more than one grade, and some more AB’s standing out. My favourite Kenyan barista, John Muli, also stopped in for a quick cupping. I left Lydia with a wishlist for which factories I’d be keen to revisit later in a couple of days and went off for a visit to the KCCE warehouse for a quick tour. After spending far too long in a hot taxi either sitting in the traffic or bumping along on the unbelievably badly maintained dirt roads (how any big trucks make it down these paths is beyond me) I pulled up to see the smiling faces of Phyllis and Lucy, two lovely ladies who market the KCCE coffees, run the cupping lab and facilitate contracts between buyers and coops. They are a young company but are very keen to get into the specialty side and very open to the exchange of information throughout the chain for overall quality improvement. Their warehouse currently holds about 14000 bags comfortably/18000 bags uncomfortably, but was only half full so far with the late harvest. Clean, tidy and well organized, these guys really impressed me and I look forward to seeing how they progress. Snailing back into the city center it had finally become dinner time. Being the season for green buyers to be in town, I was lucky enough to end up sharing a meal with a great bunch of people, like Eton Tsuno from Temple Coffee (thanks for the coffee! ), Jeff Duggan from Portola and Young Ji from Terarosa. Interesting discussions ensued on the difference between Kenyan and Central American farming, processing and sale/purchase procedures, the pros and cons of either structures, and the benefits on exchanging information and resources between such differing worlds. The next morning the trip went up country to Thika and a visit to SMS who I also visited last year. 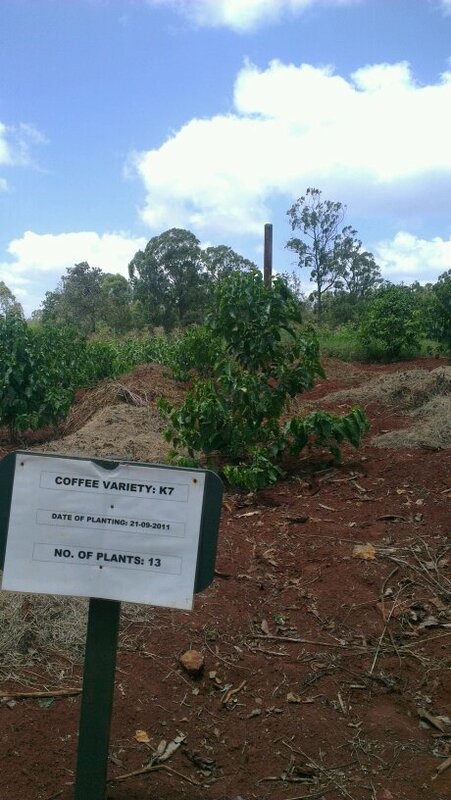 This time I took the opportunity to have a look at their varietal plot, with young plantings of K7, Ruiru 11, SL28 and SL34 trees, as well as 40 Batian trees, the new variety that has many buyers worried that quality might end up sacrificed for yield and disease resistance. The way that ECOM works in Kenya through the SMS/Highlands/Sangana structure is really interesting, and it was great to hear more news of the progress they are making in farm outreach programs. 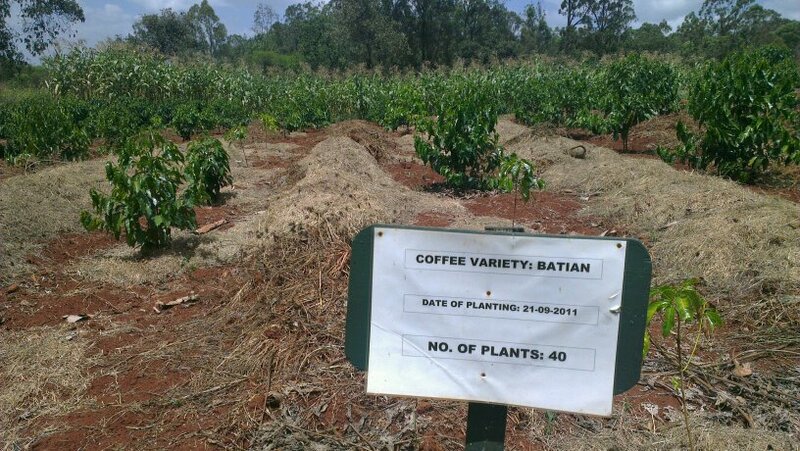 According to their numbers, in Kenya 700.000 producers have less than 4 hectares of coffee growing land, there are 2000 small estates of 4-25 hectares, and only about 200 large estates of 25 ha +. 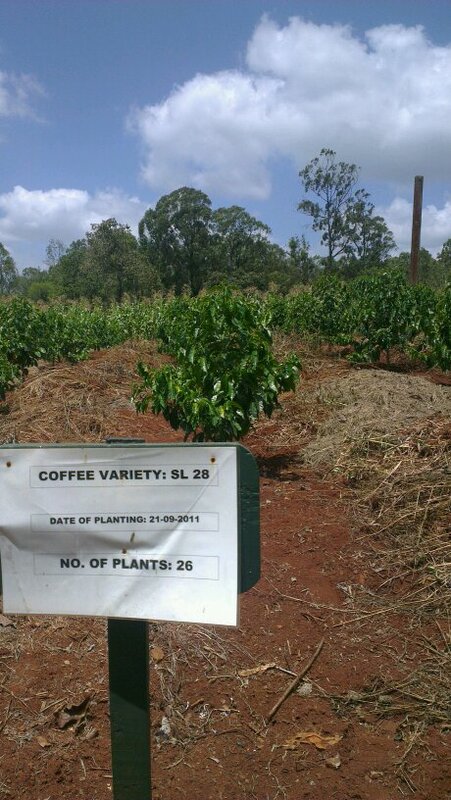 But while the smallholders have a far larger share of total land between them, the estates still outperform them on yield by 5-6 kg of coffee per tree. Of the roughly 75% of total land that they have, the shambas only produce 60% of the total cherry, while the estates represent 40% of the country’s output on their roughly 25% of the total production area. One of the goals for SMS is to organize the growers and spread information and resources among them to be able to increase their yield from 1-2 kg cherry per tree up to 5kg. This would be achieved by improving for example the fertilizing and pruning schedules. Over a 3 year period they have seen the average outputs of model farms increase by 2 to 2.5 kg, and while there is still room for improvements the early signs are good. They also target female producers specifically, as they found that while the husbands would be the ones who came to the lectures, they rarely passed the info down to their wives, who are the ones actually working the land. They have about 2000 farmers who now act as promoter farmers, and by encouraging women to step up to this role in increasing numbers, the results have improved noticeably. I also got some more detail on how the pricing structure works, from auction price through the warehouse/mill/society/factory structure down to the growers. In 2010/11 (generally a good year price wise for the growers) the average price paid at auction was $329 per 50kg of coffee. About 30% of this goes to cover taxes, commissions and fees paid to the mills, marketing agents etc. Of the 70% left, another 20% goes towards running the societies and factories, maintaining the equipment, paying staff etc. Someone correct me if I’m wrong, but that should mean that the grower should that year have received an average of $3.68 for his cherry, which compared to the (current) C is a very good price. However, the cost of production in Kenya is high and difficult to calculate, and prices are unstable from year to year as is the harvest. Seasons 08/09 and 09/10 generally saw prices of about half, or less than half, of that $3.68. We then drove northwest from Thika to Gatura, to see Mabae, the smallest of the Kinogerama Society’s five wetmills. It’s made up of about 400 members, one of them being manager Samuel Kirangi who together with Esther the record keeper and Peter from SMS took us around to see the factory. They explained their procedure which goes along with what I normally see in Kenya. The growers collect the ripest cherries in the morning, deliver to the factory between 10am and 5pm, sort again at the delivery point, and then have only their best cherries weighed and filled into the receiving tanks. They can deliver as often as 3 times per week if they want, normally picking at least once a week over the 2-3 months that harvest lasts. 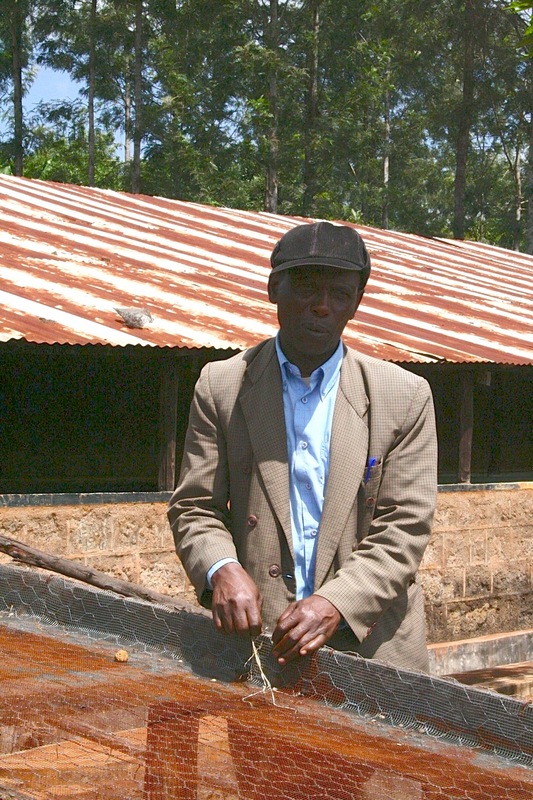 Samuel’s farm is 2 acres, one planted with Ruiru 11, the other with tea and other foods, with room for his cows. 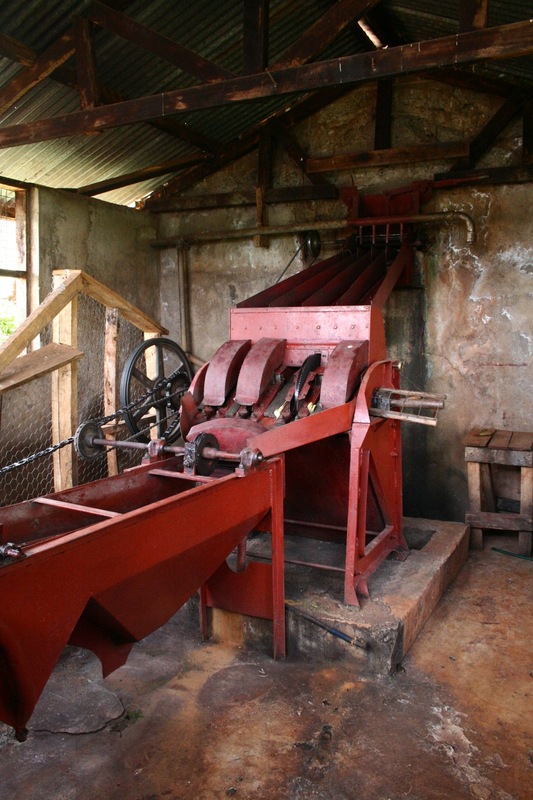 While coffee is the more profitable crop, it only provides income for a few months per year. 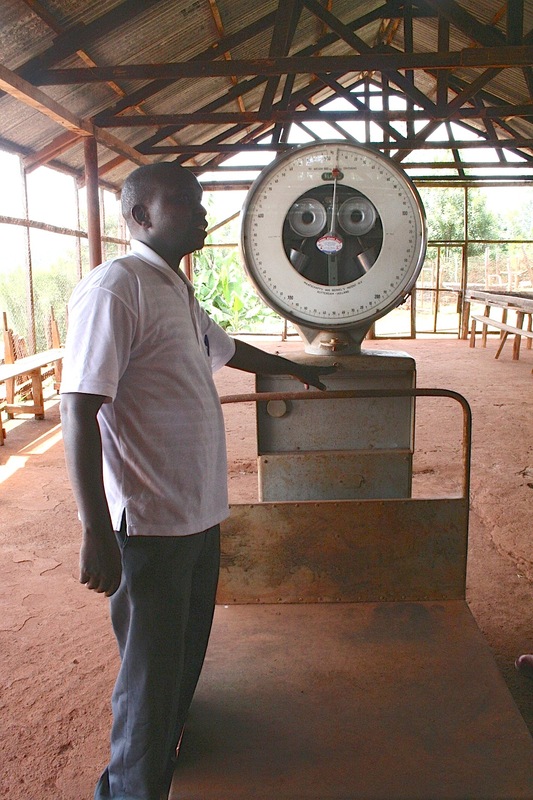 Tea however is an all year round crop, so Samuel delivers freshly picked leaves to the collection point 15 km away on a weekly basis, earning him 14 shilling per kg. 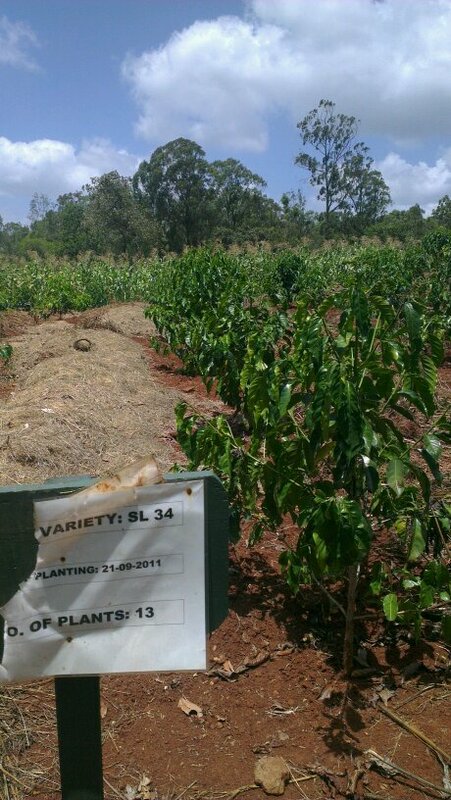 All the growers have their own identifying number and Esther will make note of everything that they bring, issue a receipt and distribute a small advance on pay issued by the society (it can take up to 4 months from picking till the coffee sells at auction). Everything about how the coffee is fermented, dried and stored is made note of, and after the coffee gets delivered to the mill, they get a milling report on how the coffee graded and cupped. This way they can implement measures to improve year on year. While this factory stopped receiving cherry 4 weeks ago, it’s easy to see how the operation works. From the collection tanks, the 4 disc pulper/sorter that can do 4000kg per hour, the fermentation (12-24 hours) and soaking tanks (4-6 hours), the skin drying (1-3 hours) and drying tables (14-21 days) and the conditioning bins. 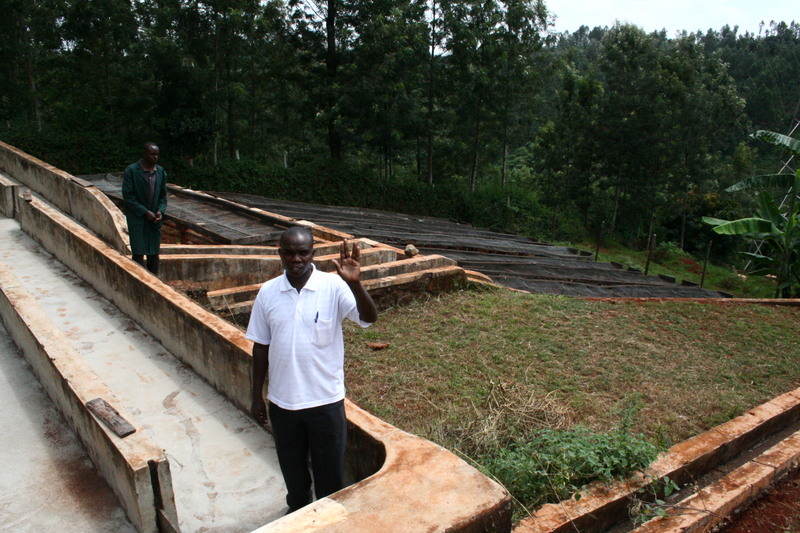 While drying the parchment is covered to protect from the intense midday sun, and at night to keep the dew away. Water is pumped up from the Chania river and recycled onsite to comply with the regulations of their certificates. The Mabae factory is at a fairly low altitude, so they have just finished their small crop, and are expecting the larger main crop in April/May. 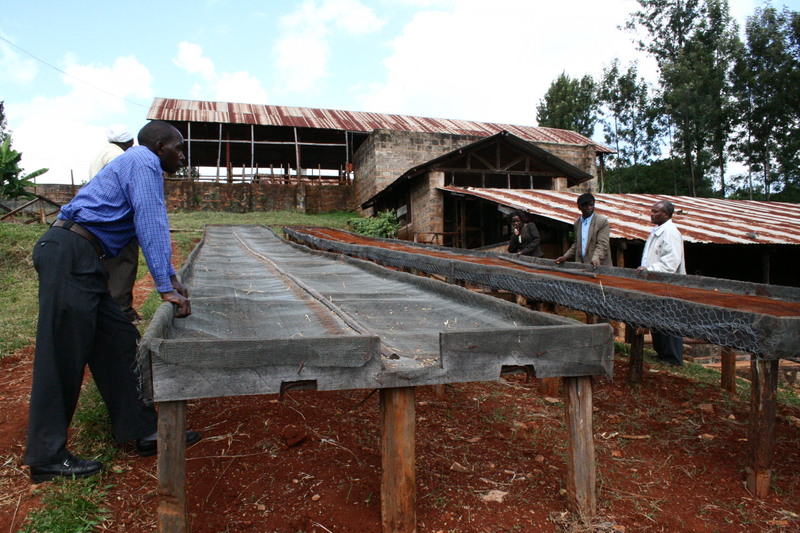 They have only been with SMS and their farm outreach project for a year, but are already seeing the benefits in more efficient management, cleanliness around the mills and better staff training. Still they are facing challenges such as low prices, lack of funds for fertilizers and machinery, and too dry, wet or cold weather at the wrong times of year. Grower motivation has been low, labour is intensive and the average age of the growers is increasing as the younger generation opts out of continuing to farm the land they inherit. 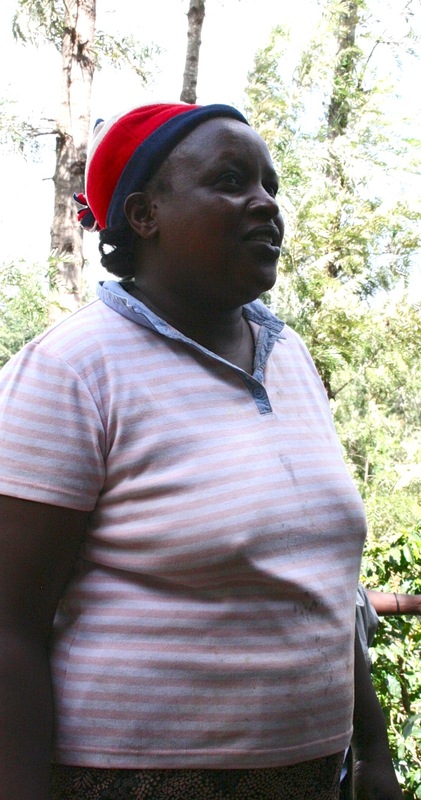 One younger producer who has embraced the SMS support and seen the benefits is smallholder Salome, who has about 200 productive trees on her shamba close to the Mabae factory. With a year’s worth of training and more focus on weed control, pruning and fertilizing with compost, her production has at least doubled. From a very low yield she now produces close to 4kg per tree, but the target is still 5+. She also has avocado trees, sugarcane, bananas, timber from her shade trees, chickens and cows to supplement her income, as the coffee trees didn’t use to pay for themselves nevermind make a profit. But with continued work she hopes to turn this trend around for good.